Almost anyone who hasn’t been to the Grand Canyon, wishes they could do this. It’s the most spectacular view, and standing on the edge of the Grand Canyon that you feel as if you’re facing the tremendous power of natural forces and time. Why is it so impressive? It consists of a huge gash across the desert, nearly 300 mph, over a mile deep along much of its length, and up to 18 miles wide. Was it really made by the Colorado River? The rocks near the base of the canyon are almost two billion years old, while those at the top were formed about 200 million years ago. Forming these deposits took about half the age of the planet. However, although the deposits took such a long time to form, it didn’t take nearly that long to make the canyon. The Rocky Mountains on the east of the plateau were also shaped by exactly the same collision. About 5 million years back, an opening was formed from the plateau into the Gulf of Mexico. Because of the altitude change from the higher reaches of the plateau to the sea, the water flowed rapidly, carrying away sand and rock. Then, during the ice ages, the water flow increased and the river cut into the rock. The debris of the water running down, during a period of a heavy flow, cuts in the sides of the canyon, making it wider, and into the river bed, which makes it deeper. Additionally, if plants are known to stabilize the soil and rock, the desert has very few of them. The lack of a complete vegetation also favors the rapidity of erosion on the plateau. 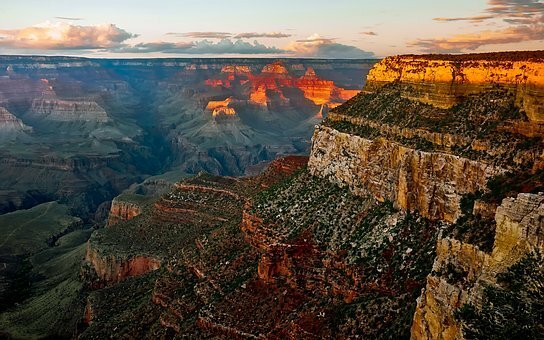 So how long did it take for the Grand Canyon to form? On the scale of geological change, only about the blink of an eye.